AKRON, Ohio – When looking back at Kansas State’s Elite Eight run last season, the lasting memory is not the loss to Butler in the regional final. It is the epic double-overtime battle between the Wildcats and Xavier in the Sweet Sixteen and the duel that ensued between Kansas State’s Jacob Pullen and Xavier’s Jordan Crawford. The players traded clutch shots for 49 minutes before Pullen iced the game for the Wildcats with two three-pointers and two free throws in a 46-second span during the second overtime, as Kansas State won 101-96. Pullen will have to step up again this season, as the Wildcats lose three starters, including second-leading scorer Denis Clemente, but return enough talent to be a Final Four contender. Taking on a bigger role is not a new concept for Pullen, who has improved his numbers in scoring, rebound, assists, steals, free-throw shooting and three-point shooting every season he has been in Manhattan. Pullen took his biggest step forward last season, going from an inconsistent shooter without a defined role to one of the best backcourt scorers in the country. With a clear-cut outlook on what he needed to do, Pullen had a monster season. Since he decided to bypass the NBA Draft in favor of returning to the Wildcats for his senior season, another outstanding campaign could be in store for the 6-foot guard from Chicago. If success is indeed a primary criteria for Player of the Year honors, Pullen has a great shot to get consideration for the nod. Kansas State returns forward Curtis Kelly to the starting lineup, while frontcourt holdovers Jamar Samuels and Wally Judge are prepared for a bigger role. Moreover, 7-foot returnee Jordan Henriquez-Roberts and 6-10 junior college transfer Freddy Asprilla, who averaged close to a double-double at Florida International two seasons ago, bring even more size to the equation. Pullen is excited about the frontcourt’s potential. “We have good chemistry and a good team coming in,” Pullen said. “We’re young, athletic. We have all the tools to be a national championship-type team. We have a lot of bigs, and they’ve gotten better this offseason. Freddy [Asprilla], Jamar [Samuels], Curtis [Kelly], they’ve just gotten better, and it’s going to make us hard to guard. We’re up-tempo and the bigs will be hard to defend. Because the Wildcats will be so young, Pullen expected to have rising senior Dominique Sutton alongside him as a leader. However, Sutton left the team earlier this summer due to family issues. Although Sutton did not put up gaudy numbers, Pullen is not underestimating his departure. With Sutton and Clemente gone, Pullen knows another perimeter player needs to increase his production and play a major role. When asked, he singled out Shane Southwell, a freshman from New York, as someone who impressed him in early workouts. 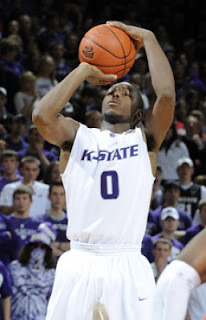 Kansas State fell one round short of the Final Four last season, and although the Wildcats lose three starters, Pullen thinks they can take that next step and advance to Houston.